Join SAP for a pre-recorded webinar on June 28 and learn how you can partner with SAP to build SAP S/4HANA cloud extensions with SAP HANA Cloud Platform. 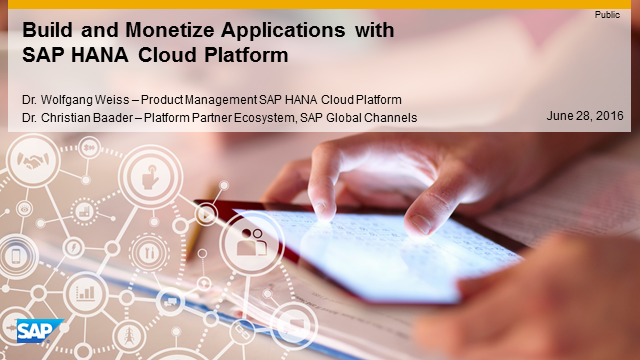 SAP HANA Cloud Platform provides comprehensive platform as a service capabilities and broad business content access for partners to extend existing customer solutions, integrate and build new digital apps which can be monetized via attractive routes to market options. In today’s digital economy SAP is enabling organizations to simplify their business processes and remove complexity. This will allow our customers to adapt quickly to fast changing market requirements and to effectively implement innovative solutions. This webinar will highlight how to build SAP S/4HANA extensions with SAP HANA Cloud Platform. SAP S/4HANA, our next generation business suite, helps customers benefit from a set of simplified, digital core business processes which connect people, devices, and business networks in real time. To support your exploration and adoption of SAP HANA Cloud Platform, interested webinar attendees will have an opportunity to participate in a follow up workshop. This webinar is intended for business decision makers within partner organizations, ISVs and solution providers. At the end of the webinar, you will be invited to submit use case proposals as a prerequisite for joining the partner program and participating in a free onsite workshop. Workshops will be offered in either Chicago or in Walldorf to facilitate the coaching of partners on the design of their SAP S/4HANA extensions.